(JTA) — When the rock musical “Spring Awakening” premiered on Broadway, it was a critical darling and financial success. It won almost every major award possible, including eight Tonys, four Drama Desk Awards and even a Grammy. So perhaps it’s not so surprising that it’s been revived on Broadway, even if it’s only been six years since it ended its successful run. Certainly more startling, though, is that the current production of “Spring Awakening” features a cast of deaf actors signing their lines — and songs. 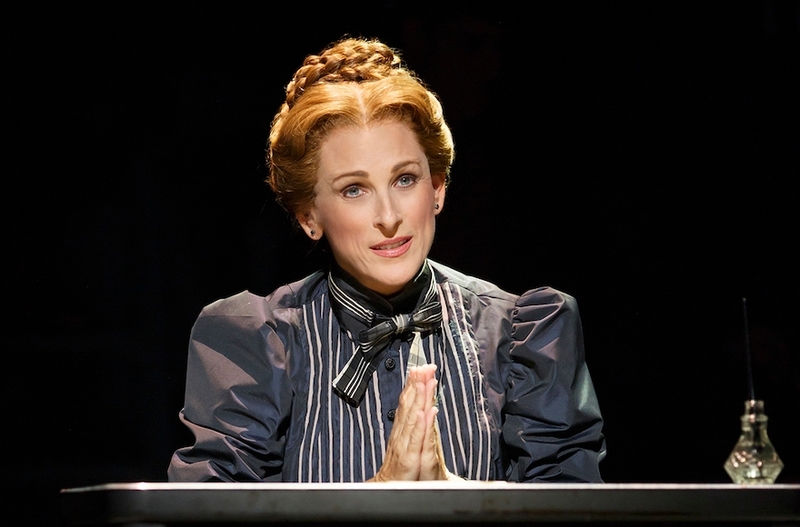 Even one of the show’s most high-profile stars, Marlee Matlin, concedes that people might consider the idea — deaf actors performing a musical — a bit strange. “It’s almost ironic,” she said through her longtime interpreter, Jack Jason. She was on the phone with JTA en route from an interview in Brooklyn to her temporary Manhattan digs rented for the duration of the play, which runs through January. “You’re talking about something that doesn’t happen every day,” she said. “People who haven’t seen the show have to wonder, how is this going to work? Each deaf actor is accompanied by a hearing one, who sings or speaks what is being signed — in essence, two actors play each main role. While that may sound awkward, it takes audience members just a few minutes to become oriented, in part because the show, a production of the Deaf West Theater, is so creatively staged. Set in Germany in the late 19th century, the “awakening” in “Spring Awakening” is a sexual one. A group of adolescents must deal with feelings they don’t understand and their repressed parents do not explain. The musical has a rousing score by Steven Sater and Duncan Sheik that particularly comes to life when the young actors sing as an ensemble. When that happens, the deaf actors become like dancers; through their fast-paced use of American Sign Language, their hands combine the precision of the Rockettes with the artistry of ballerinas. Although, like Matlin, a few of the deaf actors have some hearing, “It is not about hearing the music,” she says. In fact, several of the actors who have minimal hearing decided — whether for aesthetic reasons or just to make a statement — not to wear hearing aids during the performance. The counterintuitive performance adds a moving and affecting layer to the show it didn’t have in its original production. Matlin says people stop her after every performance to comment on how awe-inspiring this version is. It was a process with which she was vaguely familiar. “I didn’t listen to music [when I appeared] on ‘Dancing With the Stars,’ she says. “I just used an internal metronome and went with it.” That was in 2008; she was the sixth celebrity eliminated that season. “Going with it” is something she’s been doing for a long time. Matlin, 50, was born in a Chicago suburb, the only deaf person in her family. She started to lose her hearing at 18 months. “I have no idea why and probably never will,” she says. Her family belonged to B’nai Shalom, the Jewish Temple for the Deaf, in nearby Skokie, which was run by a hearing rabbi whose goal was to bring the deaf and hearing Jewish communities together. “It started out with deaf and and their hearing family members going to temple together, but it attracted a great number of hearing people” as well, she says. For Matlin, it provided not only a link to other deaf people, but to her religion. Matlin signed the English parts of the service but learned her Torah portion phonetically and read it in Hebrew. Matlin wasn’t the only one who did that, and she concedes some of what the deaf children read was unintelligible to members of the congregation. The experience at the temple encouraged her in other ways, she maintains. “It gave me the drive, it gave me the foundation to believe in myself, despite what other people say,” Matlin says. Her family was also a pillar of strength. At 7, when she said she wanted to be an actress, they enrolled her in a program at the Chicago-based International Center on Deafness and the Arts. “They loved the idea that I could dream — that I could dream big and wanted to be an actor,” she says. There Matlin immediately pursued and landed the role of Dorothy in “The Wizard of Oz.” She continued to appear in the center’s productions for about nine years, until she was 16. Another Jewish actor, Henry Winkler, also provided critical encouragement. He saw one of her performances and went backstage afterward. Her nuanced performance as a custodian at a school for the deaf who becomes romantically involved with a hearing teacher (played by William Hurt) garnered her, at age 21, both an Academy Award and Golden Globe Award for best actress — along with a smattering of criticism. One prominent commentator claimed that she didn’t deserve the Oscar because she was deaf and wasn’t really acting. Another said she won it out of pity. They were “dead wrong,” Matlin says. And she went on to prove it. She has starred in several TV series — including “Reasonable Doubts” and “The L Word” — and had recurring roles in “The West Wing,” “Blues Clues” and “Desperate Housewives,” among others. Matlin has also guest starred in everything from “Seinfeld” to “Law & Order: SVU,” the latter earning her a Primetime Emmy nomination. While her professional life was relatively ripple-free, her personal life hit rough water early on. In her 2009 autobiography, “I’ll Scream Later,” she writes of her tumultuous off-screen romantic relationship with Hurt, which was was punctuated by episodes of domestic violence. She also went through a period of drug abuse and went to the Betty Ford clinic for treatment. Fortunately, her personal life turned a corner. She married Los Angeles-area police officer Kevin Grandalski in 1993 in a ceremony that was held at Winkler’s home. Together they have four children aged 12 to 19. As to her Broadway debut, Matlin is loving it.